With Father's Day on the horizon, I saw it only fitting to dedicate a space on my little corner of the internet to my hero. And your soon-to-be-hero. I'm pretty sure I said that about my mom for Mother's Day, but I'll say it again because I'm blessed enough to have two stellar parents. Why do you care? They’ve got some crazy powerful lessons to share with you if you want to be a game-changing entrepreneur. So! 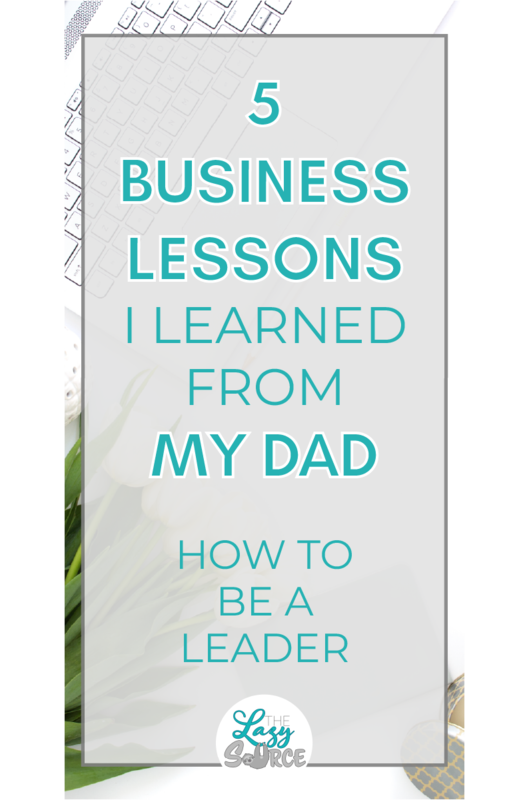 If you read my Mother’s Day post with 5 Business Lessons I Learned From my Mom, you’ll know that she’s not a business person. Business strategy, technology, numbers…not her thing. Which is probably why I get my love for it all from my dad. I still remember us sitting on the floor of the living room when I was a child, him teaching me fractions probably 2-3 years before I was supposed to learn them in school. He’s also the king of strategy. You would think that strategy and skill would only get you so far when a board game depends on rolling dice or drawing cards, but you’d be soooo wrong. I have sworn to never play another game of Risk with him. Last time I tried, I literally cried. He’s a cruel board game opponent. Interestingly enough, he’s not really a businessman in the entrepreneurial sense. He doesn’t have his own business or anything. He’s a security director, and he’s really good at his job. He’s a lifelong athlete: everything from football to bowling (he even got his first 300-game a couple years ago!). He can make wooden furniture. He can draw. He’s an archer. He’s a great cook. He’s a leader. He’s a mediator. He’s a teacher. He taught me how to play video games, how to shoot (bullets and arrows), and how to spit like a man (mom wasn’t happy). But he also taught me how to make the best buffalo chicken pizza in the world, how to use Adobe Photoshop, how to make my first Excel spreadsheets, and he even taught me how to sew! My dad has a lot to teach, so let’s start learning from him, shall we? Lesson 1: Leverage Your Momentum. How do you get things done when you’re really lazy and low on energy? The secret is momentum. Once you get it, you don’t stop moving. My dad is the master of the short-term, single-minded obsession. The nicer word is focus, but it's more than that. My dad gets motivated, and when he's motivated, he can't be stopped. When he’s got stuff on his mind that he wants to do, he’s going to get it done. Even if he has to go mow my grandpa’s lawn, make a grocery run for my mom, come home and pull weeds out in the yard, and have a 2-hour work call, he’ll still find the energy to do what he wanted to do that day. Whether that means cleaning up the garage, building a new bench for the yard, or having some quiet time to himself out on the golf course, he’ll do it. He’ll run around all over the place, jumping from task to task, until he’s ready to call it a day and pass out on the couch. I never understood how he did this. It was exhausting watching him run all over the place. We’d spend the morning together, come home, and I’d go to nap while he’d go to take on the rest of his day. Like, how?? Momentum. That was his answer when I asked him. He knew what he wanted to get done for the day, so once he got started, he let his momentum carry him through his to-dos until he’d earned the right to relax. Switch over to me, one of the laziest people on the planet. I always want to reward myself with a little relaxation any time I take one baby step of productivity for a day. Then that little “break” turns into a 7-hour Netflix binge and nothing else gets done. So consider this, from a man who has accomplished such a ridiculous amount of things in his life: Plan out your day first, then get it done before allowing yourself to relax. If you’re not getting the time to relax, or if you’re running out of steam before you get there, perhaps you’re overloading yourself each day. You’ll start to learn what you’re really capable of with the hours you have in a day. If you have to give yourself little rewards to keep yourself going, focus on rewards that have a limited time investment. Instead of allowing yourself to jump into a new Netflix episode, reward yourself with a snack. Instead of scrolling through social media, go for a quick walk outside. If it’s something that can easily go from a “break” to a “do-nothing day,” you’re just playing with fire and tempting your lazy side. … but the resulting impact you have on someone's life makes it all worth it. My dad is a leader, through and through. Some people are put in leadership positions. Some people are trained to develop leadership skills. And others are leaders in their core; it’s who they are. My dad happens to be all three. I believe great leaders can be made, yes. Some of us just have to work a little harder to get there. But my dad’s leadership qualities are interwoven in his DNA. He’s just so naturally darn good at it. And people can tell! He’s like a magnet, always drawing people towards him. I don’t even know if people realize that they’re doing it. Even complete strangers have a way of turning to him when a situation arises. It’s honestly kind of weird, but I’m proud to have someone like that as my dad. But here’s the thing: it’s not easy. There's a lot of fantasy and romanticism about leadership in the business/entrepreneurial world. But where’s the struggle? The sacrifice? The decision-making that means choosing between making some people happy and others resent you? The time it takes away from your family? The toll it takes on your mental and physical health? The emotional drain of making people’s decisions for them all the time? The pressure of being blamed when a decision you made was the wrong one? The stress of people watching your every move? That’s the reality of leadership, and I’ve watched my dad go through it all. But I’ve also watched him change people’s lives. I’ve watched him guide people through their darkest times. I’ve seen him inspire people, and drive real change through communities and organizations. I’ve seen him change the world around him. Leadership is hard, but if you’re willing to endure it and use those hardships to shape you into someone better, it’ll be worth it. Take your role as a community leader seriously. There will be challenging times, but if you respect your role, you can use it to serve your tribe that much better. Lesson 3: A relationship means there are two sides. This is my least favorite lesson because it’s the one he’s constantly reminding me of. Constantly. I’m a slow, or perhaps reluctant, learner. When you have a relationship with someone, there are two sides to everything. And not just romantic relationships. Friendships, professional relationships, sibling relationships, or even relationships with your parents. When two people are interacting with each other, there’s instantly a new degree of complexity to the situation. Because now there are two perspectives, two emotions, two levels of thinking, two skillsets, two histories, two responses, two everything. So when someone makes you angry, you have to consider why they did what they did. If someone reacts differently to a situation than you, you have to think about how their history may affect their perception of what happened. If you say something that offends someone else, you have to consider how your words may have been perceived, even if that doesn’t align with your intentions. Bonus tip from dad: It’s not what you say, it’s how you say it. Can’t tell you how many times I’ve been told that one. My dad’s always playing the mediator, and he’s always been really good about calming me down and helping me see the other person’s perspective. He knows how to get to the root of the issue and walk each person through it so everyone emerges with a better understanding of each other. It’s an annoying gift when you want to be mad at the other person, but it’s an important gift nonetheless. Developing this skill is incredibly important in the business world. It’ll help you to handle negotiations, to be a coach, to serve your customers or clients, to write meaningful sales copy, to create products that help your tribe, to solve important problems, and more. Understanding the human being at the other end of the screen is a key element to cultivating a human brand. Lesson 4: Teaching takes a special skill. We're all bloggers here, so our goal is to become online educators to some capacity. Here's the deal: To be a great teacher, you need to possess a very special ability. Do you know what it is? You have to be able to re-frame an idea in a variety of ways for several different perspectives. If you can only teach something in one way, you don't know it well enough. Everyone learns differently, so you have to be able to teach it differently! Listen, we've all been in math class where the teacher's single, textbook explanation made absolutely no sense whatsoever. I remember the exact moment when a teacher I had in high school completely unlocked my understanding of math, and I believe I have him to thank for all of my success with numbers since then! What made him so special? He knew how to approach a concept in 50+ different ways. First, he'd start with theory from the textbook. Then he'd turn it into a relevant story for fun. Then he'd show the basic mechanics of an actual math problem in a few different examples. Then he'd turn all of it into some weird comic. Have you ever had a math teacher teach pre-calculus with cartoons? The man was a genius, an artist, and should have been a stand-up comedian. I remember telling my dad about him, who explained to me why my teacher was such a good educator: He was appealing to all different learning styles for the same concept. He could re-frame it in however many ways he needed to educate his students! Once I learned that, I began to see how my dad could do that himself. Part of his job description is training and educating, but he is always teaching someone something. Remember how I said he was multi-talented? People know it. And they flock to him. "Hey Matt, do you think you could give me some archery lessons? I've always wanted to learn..."
"Hey, can you help me practice for job interviews?" "How did you learn how to make those digital collages?" "I don't feel ready to manage people, can you give me some leadership advice?" This is nothing; the real list is endless. People love to learn from him. He knows his stuff. My dad's a Jack of All Trades, and he claims to be a Master of None. However, I'd say that he's pretty gosh-darn close to mastery of a lot of things. He understands things, he can see how they work, and that helps him to be an incredible teacher. You don't have to be an expert to start a blog. But you should always strive to learn more about your subject matter so that you can be a greater resource for your audience. The more you learn and the more you experience in your area, the better you'll be at teaching it from multiple angles! And that right there will help you become an authority figure. Lesson 5: Never stop exploring. I touched on this earlier, but this is such a large part of my dad and our relationship that it deserves its own section. My dad and I are the ultimate examples of multi-passionate souls. Sports, boating, art, action movies, sappy movies, politics, religion, software, photography, business, strategy, reading, gaming, carpentry, archery, and more and more and more. My dad can do it all. And he's always open to exploring something new. Multi-passionate people have a hard time focusing and committing to a long-term passion project, sure. We get bored easily and tend to get overly ambitious when we take on a new interest (which gets expensive). But multi-passionate people bring a lot more than a desperate craving for variety to the table. We bring a diverse background, a capacity to learn new abstract concepts quicker, and an ability to connect with a variety of people. Our wide range of experiences, skills, and interests can actually come together to create unique perspectives and approaches to solve problems or generate ideas. Honestly, I used to view my multi-passionate nature as a character flaw. I felt like a quitter and a failure with a fear of commitment to top it all off. But as I grew older and watched how my dad's diverse background was one of his best qualities, I learned to embrace it! If my dad didn't have an appreciation for different interests, he probably wouldn't be so interested every time I brought him a new hobby. I still remember sending pictures to my friends of weird felt foods I created back when I was learning how to sew plushies - their responses were mostly along the lines of "That's cool" or "Aw, cute." But I brought them to my dad, and he followed every stitch and appreciated every detail. Same thing when I started learning how to sketch human faces. Or when I would tinker with video editing. Or digital art. Yarn projects. Budget spreadsheets. College papers. He appreciates people's interests, even if they're not his own, because he understands so many others. Being able to connect with people because you can easily understand them and contribute your experiences to the relationship is priceless. Even if you're not a multi-passionate soul (the world needs you mastery-types just as much! Someone's got to focus around here), I think everyone can benefit from making an attempt to understand people who might have different interests or skillsets than you. Embracing the diversity of humanity is a key component to being able to reach, connect, and impact people. My dad's a goof. He's clumsy and loud. He was born with a wacky nervous system so he's always hurting himself without realizing it. He always blames the lane oil when his bowling game's off. And he blames the controller or the game AI when my brother destroys him in their basketball video game. He's an obnoxious-channel-changer, meaning you'll only ever watch clips of every show and movie being played on television. He pronounces most words wrong and makes up his own rules for the English language. He's horrible with names. He spent at least a decade asking "What's that noise?" every time the clothes dryer beeped when it was done. He broke my mom's NASA-approved-unbreakable-cups in record time. He thought the best way to keep me safe as a child when he was putting up Christmas lights on the roof was to strap me to the chimney with bungee cords (mom came home and did not approve, but I loved it). And he shot an arrow right through our air conditioner and made us famous among AC-repairmen in our county. He's also one of the wisest men I ever knew, and he is my hero. Bam. Here you go, dad, this counts as your Father's Day card this year. Love ya. It's not just about my dad. Listen, I get it, he's not your dad. Just like my mom wasn't your mom. But if you made it down to this point, I'd venture to say that you got a little roped in by his character. I told you, it happens. When you're building your blog as a business, you're in charge. You're leading. Even if you don't have a team of employees, you're going to be leading your audience. You're heading up a community of people, trying to promote a change! I hope that you learned a few lessons today about being the best leader you can be. If you did, send a shoutout to my dad in the comments! Then tell me some of the greatest lessons you've learned from the world-changing men in your life!